Title: Reduction in symptoms associated with Fibromyalgia at six weeks using Intravenous Vitamins and Minerals (Myers Cocktail). Author: Dr. Shawn Meirovici N.D.
Abstract: Fibromyalgia is a musculoskeletal disorder characterized by widespread pain commonly with one or more coexisting symptoms. Treatment often includes both non-pharmacological and pharmacological therapy. Pharmacological therapy includes the use of antidepressants and GABA derivatives with varying success rates and often with unpleasant side effects. Micronutrient infusion is a newer approach with the majority of use in the field of alternative medicine. To date one placebo controlled pilot study has examined its use in fibromyalgia patients noting statistically significant effects on pain and fatigue. 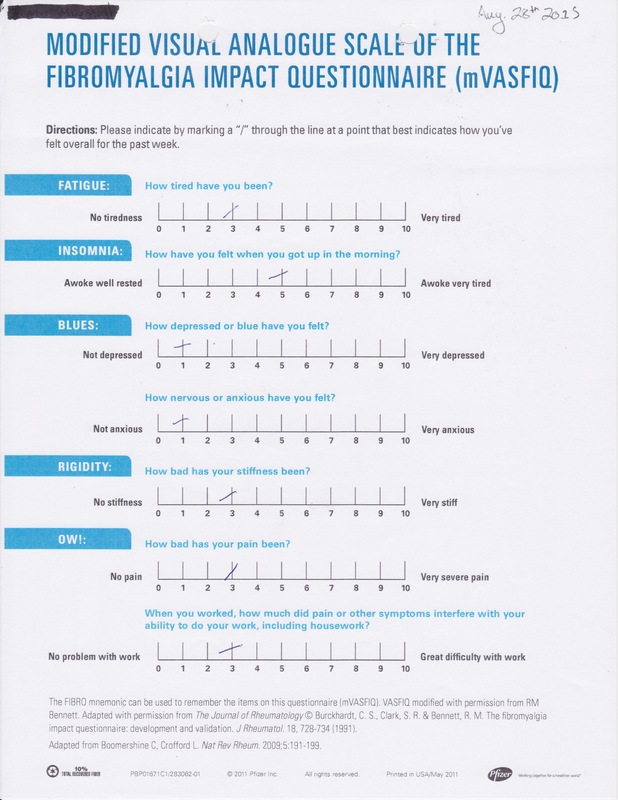 The following is a case study using a similar “cocktail” as the one used in the placebo controlled trial, for 4 treatments using the modified visual analogue scale of the fibromyalgia impact questionnaire (mVASFIQ) as an endpoint measure. Significant reduction in all parameters of the mVASFIQ was noted at 6 weeks, suggesting that micronutrient infusion should be further investigated as a treatment approach for fibromyalgia. Introduction: Fibromyalgia is characterized by chronic widespread pain, increased tenderness at specific sites known as “tender points,” un-refreshing sleep, fatigue and cognitive dysfunction not attributable to other disease states. While the etiology of fibromyalgia is not entirely clear, associations with trauma, adverse life events, impaired mood, anxiety, irritable bowel syndrome, cold intolerance, paresthesias and other medical conditions have been described. The pharmacologic treatment of fibromyalgia ranges from antidepressants to analgesics. Here we are commenting on a novel treatment involving the infusion of vitamins and minerals also known as a Myers Cocktail. Case Presentation: J.M. is a 38-year old female who had been diagnosed with fibromyalgia in 2008. Her symptoms started approximately 10 years ago after enduring a series of traumatic life events. Symptoms included: chronic widespread pain, non-restorative sleep, muscle weakness, morning stiffness, subjective swelling, multiple chemical sensitivities, frequent severe headaches, vestibular dysfunction, TMJ, paresthesia, chronic fatigue, dysmenorrhea, anxiety and irritable bowel syndrome. J.M. had tried a number of GABA derivatives, antidepressants and analgesics with varying degrees of relief but with significant adverse reactions including aphasia, depression and dyspepsia. At initial presentation, J.M. was taking Wellbutrin 300mg XL daily and Tylenol with Codeine as needed. She felt that she was starting to develop a tolerance to Wellbutrin. She was not taking any dietary supplements and was not on any type of specialized diet or exercise program. J.M. was prescribed an intravenous infusion Myers Cocktail (B-complex 1ml, Dexpanthenol 250mg, Pyridoxine 100mg, Hydroxocobalamin 1mg, Ascorbic Acid 2000mg, Calcium Chlroide 100mg, Magnesium Chloride 1000mg and Sterile Water 46ml) via 60cc syringe with a 24 Gauge butterfly needle at the right median cubital vein, delivered over 15 minutes once per week for 4 infusion sessions. 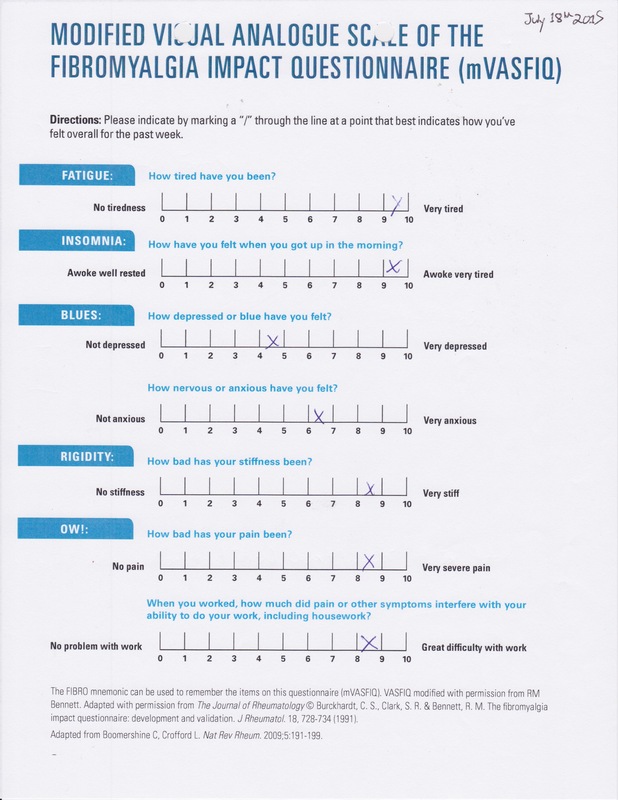 This patient completed a modified visual analogue scale of the fibromyalgia impact questionnaire (mVASFIQ) at initial consult (Image 1) and again after her final infusion (Image 2). She was also prescribed magnesium malate 1.5 grams per day, 1000iu vitamin D per day and 1mg melatonin at night 30 minutes before sleep. However, J.M. was admittedly not taking these supplements consistently during the 4 weeks of intravenous treatment. The mVASFIQ score at treatment initiation was: (Fatigue 9.5, Insomnia 9.5, Depression 4.5, Anxiety 6.5, Rigidity 8.5, Pain 8.5, Difficulty with work 8.5) at four weeks the mVASFIQ score was: (Fatigue 3, Insomnia 5, Depression 1, Anxiety 3, Rigidity 3, Pain 3, Difficulty with work 3). Besides mild nausea and flushing during the first treatment no adverse effects were reported. Discussion: Micronutrient infusion delivers vitamins and minerals involved in stress response, muscle contraction and nerve signaling, while able to bypass the need for gastrointestinal absorption. This is an effective delivery method for chronic conditions, such as fibromyalgia, where there is often gastrointestinal disruption as well as the potential for micronutrient deficiencies. The results of this case study demonstrate that micronutrient infusion Myers Cocktail may be an effective treatment for fibromyalgia related symptoms as indicated by a decreased in symptoms score on mVASFIQ at 6 weeks post treatment. This joins the small collection of evidence for the validity of this treatment for fibromyalgia. More study into this treatment for fibromyalgia is warranted. Confounding Factors: As was outlined in the treatment plan, J.M. received a few dietary supplements on initial consult; however, J.M. admitted to not taking these consistently throughout the 4 intravenous treatments. The patient received all 4 infusions by myself and was not blinded to the treatment. There was also no placebo control. Additionally, the patient may have been influenced by the doctor patient relationship or through placebo effect. However the significant improvement observed within a relatively short time helps to validate the results of this study. Myers’ Cocktail, Dr. Alan Gaby M.D., Alternative Medicine Review, Volume 7, Number 5, 2002.
mVASFIQ for J.M. on July 18th 2015 (patient incorrectly marked X in box rather than a check through the appropriate line, therefore, results have +/- 0.5 confidence interval. mVASFIQ for J.M August 28th 2015. Thanks to my father who shared with me regarding this website, this webpage is genuinely awesome.